Today we had quite an exciting begining! Papi and I were awoken to the sounds of our amazed children marveling at the tiny treats they found in their little shoes left by the fire place last night. They were so excited to see the little foil covered chocolates, candy cane, and tape. Tape? You ask? Yes, tape! :) Like the kind you wrap presents with! It seems these boys are never more content in this life than when they've got things like tape, rubber bands and yarn. What's funny is that they were not at all shocked that St. Nicholas had brought them something for being good little boys, but that St. Nicholas knew Papi liked Snickers bars and got him one ;) They just could not get over the fact that he actually knew! 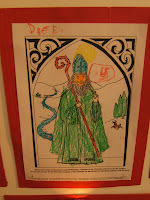 After breakfast, the boys each got a different picture of St. Nicholas to color from SaintNicholasCenter.org and then our 6 year old read A Saint Nicholas Story to his brothers. 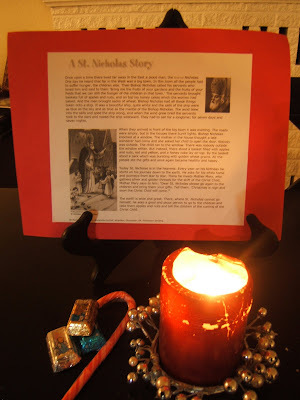 Jessica over at Shower of Roses had a great practical life activity for her children to do based on St. Nicholas. Her children made some St. Nicholas Hot Cocoa mix to give away to friends and family for Christmas. I think this is a wonderful idea and a great way to incorporate some Montessori practical life activities during this season of Advent. I know the children will be thrilled to do this! Thanks for the idea Jessica! Click on the link above to take you on a daily Advent Adventure! Our children have been enjoying this so much and I'm even learning along the way as well! 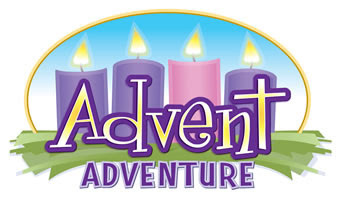 Advent adventure has been more than perfect to include in our Catholic Living studies and experiences for this time of year! It's a great resource, and the best part is that it's FREE! :) I thought you might enjoy it as much as I have. I heard about it on the 4RealLearning forum and am very glad we checked it out! Take a look! We interrupt your Internet browsing (hopefully using goodsearch.com! ), to bring you this public service announcement on toys... Not just any toys, I mean good toys! Although gifts are not the point of Christmas, many of us do plan on buying or making gifts for our children this time of the year. I wanted to share some of the things that we enjoy providing for our children in case you were in the need of ideas. Ok, so many of you know that I am the mother of 5 children ages 6 and under. That being said, you can imagine that if certain precautions were not taken, my life and house would be an absolute crazy mess! I'm not saying that at times it's not, but things are a lot better than they would be if we didn't have our children's toys and entertainment under control. I am very... extreeeemly... picky about toys! When son #1 was born, I tried to choose his toys carefully, always trying to make sure there was some sort of educational or developmental value to the things. Well, 7 years and 5 kids later I look back and think, "That was nothing! You should see me now!". Right off the bat, anything with flashing lights,and things that play music by themselves or even worse, toys/dolls that go off and start talking/singing by themselves (kind of scary!) ... Gone! Art supplies galore! We provide the kids with different types of paper, with different textures, colors, and purposes. Tissue paper, construction paper, watercolor paper, doodling paper, textured card stock, etc.. We also provide them with modeling clay, oil pastels, watercolors (the more colors the better! ), tempera paints, acrylics, crayons, colored pencils, wax, felt, glue, pipe cleaners, etc. Also providing them with books for inspiration and art ideas makes a great gift with supplies. Books, books, and more books! I try and take care to provide books with nice illustrations and good stories or poems. I do my best to avoid "twaddle" type books, so gross looking characters or stories are definitely out. I respect my children, so why would I give them junk? Books are pretty easy to come by too. You can get them at garage sales, thrift stores, and for free at your local library! Music is always a hit with children! Having a few well chosen Cd's, access to a CD player and basket of instruments near by, is a great way to ignite a love for music in the home. We particularly like Elizabeth Mitchell's You Are My Little Bird CD. It has a sweet version of Bob Marley's "Three Little Birds", that we all enjoy singing together and that is easy to play along with rhythm sticks and instruments. 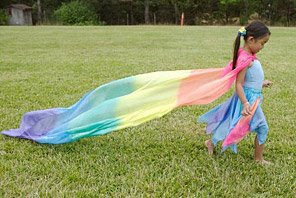 One of the boys most versatile and favorite toys are their silk play cloths. We bought six of them in colors for them last Fall. They've played with them so much, almost everyday, so we are planning on buying them some more for Christmas. The kind we bought are from Sarah's Silks , and they are such a wonderful open ended toy! The boys use them for capes, tie them together to make "trains", put them on their head to pretend they are shepard's, and all sorts of other things. These are awesome for creative open ended play! Catholic books, stories on CD, pictures and videos have proven to be a wonderful resource and font of learning for our children. These are the kinds of things we can share together and help them grow in virtue and love for God and the world He created. Some of my children's favorites are Glory Stories Cd's that you can get from HolyHeroes.com. For Videos, my children enjoy watching the videos from CCC, which you can purchase at AdoremusBooks.com. Last but not least, we provide our children with real life objects. The Montessori philosophy tells us that children like to imitate adults. We've all seen this happen. Whether you are dusting the furniture, sweeping the floor, or cooking, children like to mimic what you are doing. This is a great opportunity for them to learn real life skills! We do our best to provide them with real life objects they can use to help themselves and take care of their surrounding environment. Things like child sized brooms, cooking utensils for making snack, and real child sized gardening tools are fun things for them to use, while providing them with the satisfaction of accomplishing a real task. 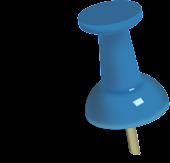 You can purchase the child sized items mentioned and more from the For Small Hands catalog. For Small Hands is having a promotion for schools that ends December 31, 2008. Any purchase of $25 or more can be used to apply a 10% credit of your total to the school of your choice. If you happen to decide to place an order with them, please consider applying the credit to my family's home school. We are Queen of Heaven Montessori, and our customer number is #164813.